Thousands of runners on Thursday are expectede to flock to downtown San Jose for the annual "Turkey Trot" race on Thanksgiving. Bob Redell reports. Thousands of runners on Thursday flocked to downtown San Jose for the annual "Turkey Trot" race on Thanksgiving. 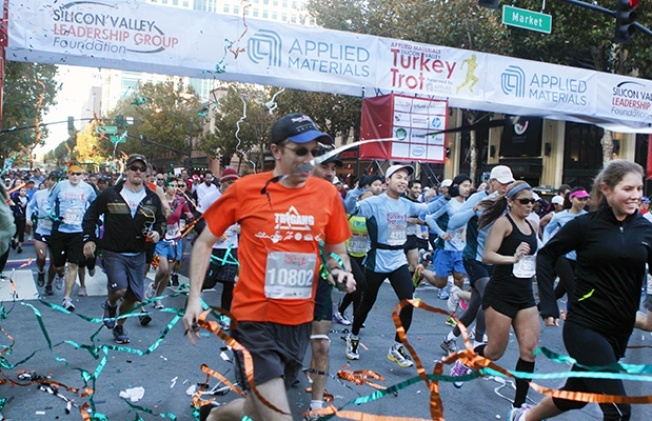 The 13th annual Applied Materials Silicon Valley Turkey Trot, which is hosted by the Silicon Valley Leadership Group Foundation, kicked off at 8:30 a.m. for most 5K and 10K runners. Some elite runners fired out a bit earlier. Youngsters were able to enjoy a fun run and fun zone while the adults burned some calories. The race snaked through the downtown area, leading to some road and highway ramp closures during the morning hours.